आप Minimum Wages in West Bengal की जानकारी लेना चाहते हैं. मगर हम काफी समय से Latest Minimum Wages in West Bengal का Circular सर्च कर रहें, जो कि अभी तक हमें मिला नहीं हैं. जिसका मुख्य कारण यह हैं कि West Bengal Labour Department का वेबसाइट अंडर मैंटेनस शो कर रहा हैं. यह पिछले कई सप्ताह से डाउन किया हुआ हैं. जिसके कारण हम अभी 2018 का Circular की जानकारी उपलब्ध करा रहें हैं. जैसे ही Labour Department के द्वारा 2019 का Circular जारी किया जाता हैं. वैसे ही हम उसकी जानकारी भी उपलब्ध करने की कोशिश करेंगे. 6, Church Lane, 4th floor, Kolkata – 700 001. The following shall be the minimum rates of wages in the employment of Hosiery Industry in the state of West Bengal as per notification number 152-MW/2W-19-2009 Dated 16.10.2012. These rates are effective for the period from 01st July 2018 to 31 st December 2018. The classification of employees is as follows:- Unskilled Workers: Packer, Hand Bleacher, Helpeers, Durwans; Semi-Skilled Workers: Cutter, Neck-Labeiler, Check Mender, Mender, Dyer, Finishman, Chainman, Matchcutter, Overlock, Pressman, Stitcher Mechanic, Carpenter, Body Machine, Tailors (Hosiery), Machine Bleacher, Machine Dier, Calender (Cold), Fireman, Checkingman; Skilled Workers: Production Supervisor, Supervisor, Steam Calender, Biilerman, Clerk, Master. Implementing areas: Zone ‘A’=(i) Areas Notified under Kolkata Metropolitan Development Authority(KMDA), (ii) Asansol Municipal Corporation, (iii) Durgapur Municipal Corporation, (iv) Siliguri Municipal Corporation, (v) Digha-Shankarpur Development Authority, (vi) Thermal Power plant areas including Township areas, (vii) All the Municipal areas in different Districts, (viii) All the Sub-Divisions in the districts of Howrah, Hoogly, Burdwan and 24- Parganas (N)[excluding Barasat and Basirhat], (ix) Alipur SubDivision and Baruipur Sub-Division in the district of 24-Parganas(S), (x) MidnaporeSadar SubDivision and Kharagpur Sub-Division in the district of West Midnapore, (xi) Siliguri sub-division in the district of Darjeeling, (xii)Bankura Sub-Division and Bishnupur Sub-division in the district of Bankura, and (xiii) Raghunathpur Sub-Division in the district of Purulia. Central Government Minimum Wages Notification Oct 2018, यहां डाउनलोड करें. दोस्तों, अगर इसके बाद आपका इसके बारे में कोई भी सवाल होगा तो नीचे कमेंट बॉक्स में लिख सकते हैं. 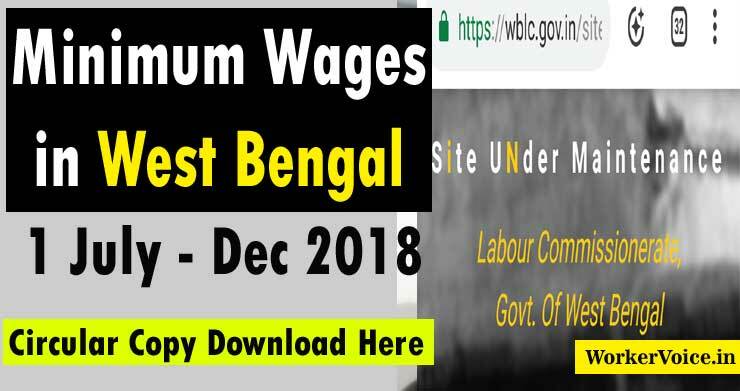 Minimum Wages in West Bengal 2018 Notification PDF डाउनलोड करने के लिए नीचे के लिंक को क्लिक करें. Minimum Wages in UP Notification for 01.10.2018 to 31.03.2019, यहां डाउनलोड करें.